not feeling up to speed? we got you. below are some of the most significant recalls we covered from october. for more coverage, check out our recalls page, and for a comprehensive list of recalls that include all things road-going, check out the national highway traffic safety administration's page here. ford's year of magical thinking that it should slice out its sedan business in the u.s. moving forward doesn't seem all that blinkered when you consider that the biggest recalls in two of the past four months have involved the fusion (july) and, here, the focus (though reliability could stand to improve all around given september's biggest recall was the f-150). 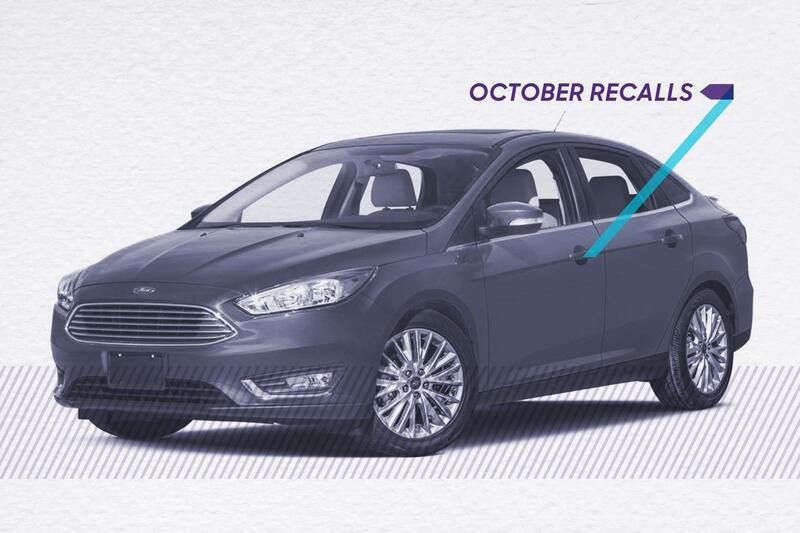 october's leading recall involved 1.3 million focus cars — which, it should be noted, also includes hatchback variants — and was for a canister purge valve that may ultimately lead to the used engine stalling. though ford said it wasn't aware of any related accidents or injuries, it advises owners to keep their fuel tanks at least halfway full until their car has been serviced. if the thought of eyeing your gauge twice as often as you usually would stresses you out, get this taken care of asap. take heart, ford focus: the past couple of months haven't been kind to toyota's much-loved prius hybrid, either. in september, some 192,000 priuses were recalled for an used engine wire harness that could lead to a fire; in october, more than 800,000 were put on notice for a software malfunction that could lead to the used engine stalling. this followed up two previous prius recalls from february 2014 and july 2015, and while toyota didn't immediately announce an owner-notification schedule, our fingers are crossed that the third time's the charm for this one. anyone reading this might be surprised to discover that toyota and its lexus luxury division comprise seven of the top 10 predicted most reliable cars in consumer reports' latest survey of such (and we'll certainly be interested to see how that changes when the hard data start to roll in) given that 168,000 toyota avalon sedans, sequoia suvs and tundra pickup trucks were affected by yet another software issue. this one (euphemized by the company as "inappropriate programming") could disable airbag sensors used to detect crashes, which is exactly as serious as it sounds. dealers just have to, uh, "appropriately" reprogram the airbag electronic control unit as a fix. to say it would be inappropriate for owners to hesitate on getting this one fixed is an understatement. after an august that saw it lumped in with two of the month's three largest recalls, the 2019 jeep cherokee was once again hit with an issue. this one came on the very last day of october and affected some 86,000 suvs; the recall stems from a malfunctioning powertrain controller that led to the month's most (un)popular aftereffect, an used engine stall — in this case, specifically during deceleration. though restarting the used engine should be easy enough to do in the moment, dealers will reflash the powertrain controller to resolve the problem for good. mazda has generally kept off the radar for big recalls this year, but this one for 49,000 mazda6 sedans ranked among october's biggest despite owners in only 22 states being affected. there's a reason for that, though: this recall concerns a front cross-member corroding after prolonged exposure to road salt, and affected owners are almost entirely to be found in the northeast and midwest. if you think this is a possible issue for you, click the link above or look for a notice from the automaker starting around mid-november for further instructions on a repair.